About - Katrin Terton - fibre.rust.skin. 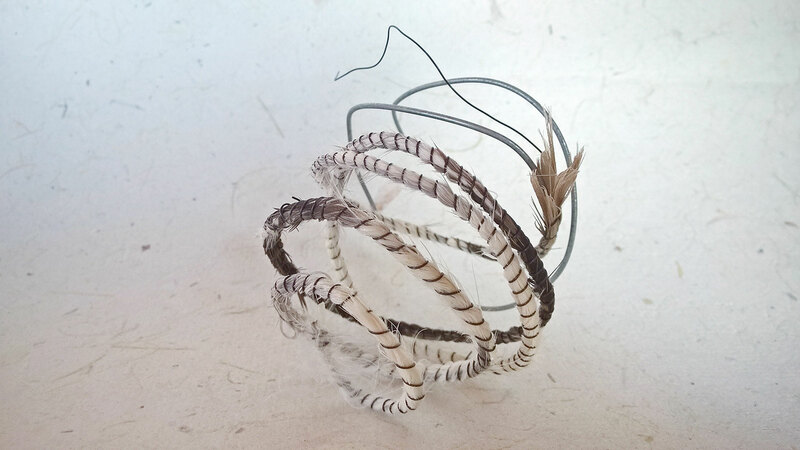 Katrin Terton’s mixed-media work continues her focus on the tenuous, liminal elements of the world around and within us, on transformation and impermanence as well as the alchemy of working with natural materials and found objects. Katrin is drawn to nature's discards and other found objects that are often overlooked by others. For the artist these are small everyday wonders and a constant source of inspiration, to be found anywhere while she wanders the world. Katrin maintains the nature of the materials as much as possible in her works, keeping them as raw, fragile and broken as they are. While Katrin’s works are overtly tactile, they hint at unreachable secrets. Viewers often find the use of organic and man made materials like human hair, driftwood, plant materials, wax, kombucha fabric, bones, rusty metal pieces, both compelling and confronting as it evokes thoughts around our own vulnerability, life and death and how we feel about changes within and around us throughout time. All gathered materials and found objects have their own individual history; their journeys are told in the marks and scars that catch Katrin’s attention. The quality of discovery is an essential component of her work which is mainly process oriented. It is the element of unpredictability in the materials that intrigues her. Each piece has its own natural momentum. Memories, reflections and emotions get inexplicitly caught up in the materials’ past. The works then are as transient as the materials themselves, yet like the original forms they are created from, their content remains resilient, personal and adaptable. Katrin always aims to leave enough untold to inspire the imagination of those who cross their path. More recently she is focusing on creating multi-sensory works that can also be experienced by bind and vision-impaired people. These works might include elements of touch, sound and smell, providing and immersive, interactive and sometimes collaborative experience.